Come and enjoy with us this unique experience of interacting and feeding a Southern Stingray, together with snorkeling amongst coral reefs and tropical fish. 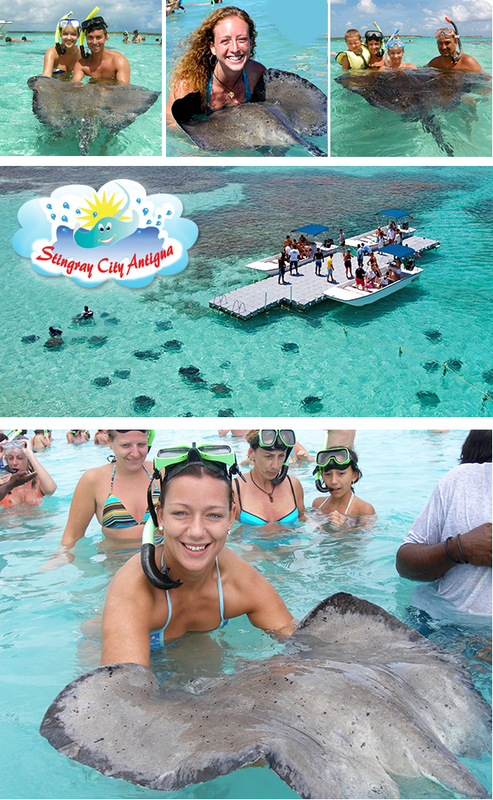 Our Southern Rays are friendly and gentle, making your Stingray City Snorkel Adventure the highlight of your vacation. Start your adventure off at our land base, where our experienced guides will brief you all about the Southern Rays. A scenic 5-minute speedboat ride between Antigua’s offshore islands will whisk you off to a shallow stingray pool with a white sand bottom surrounded by coral reef. Our Stingrays are not enclosed and as your boat arrives so will the Stingrays. Once your boat has been moored, you'll enter the water from the floating platform, where you'll be greeted by the friendliest southern stingrays with the relaxed familiarity of old friends. Whether you choose to stand or swim you’ll have the unique opportunity to hold, feed and interact with stingrays during your encounter, all the while learning about these amazing and captivating animals. After interacting with the Rays there will be time for you to snorkel among the coral reefs and tropical fish. On returning to the land base where you can rinse off under the bright in a shower under a coconut tree. Also, enjoy complimentary rum or fruit punch, purchase your pictures or anything from our collection of merchandise and just share this unique experience with your fellow guests.